Work. Family … Netflix. These are a few of the obligations (and don’t-want-to-admit-I-spent-4-hours-binge-watching-House-of-Cards pastimes) that keep us from exercising. You know that feeling you get after a good run? When your heart is pumping and sweat starts to cool on your temple as you work to catch your breath? You know it. It’s the feeling of being alive. Don’t let your busy life keep you from living. Get out there and earn your next runner-approved ice cream indulgence. This interval run only takes 10 minutes – 16 if you include your warm up and cool down (Don’t skip this!). You have 16 minutes. That’s shorter than a Friends rerun with time to spare. Each interval in this workout is based on a unique RPE. “What’s an RPE?” you ask? Good question. 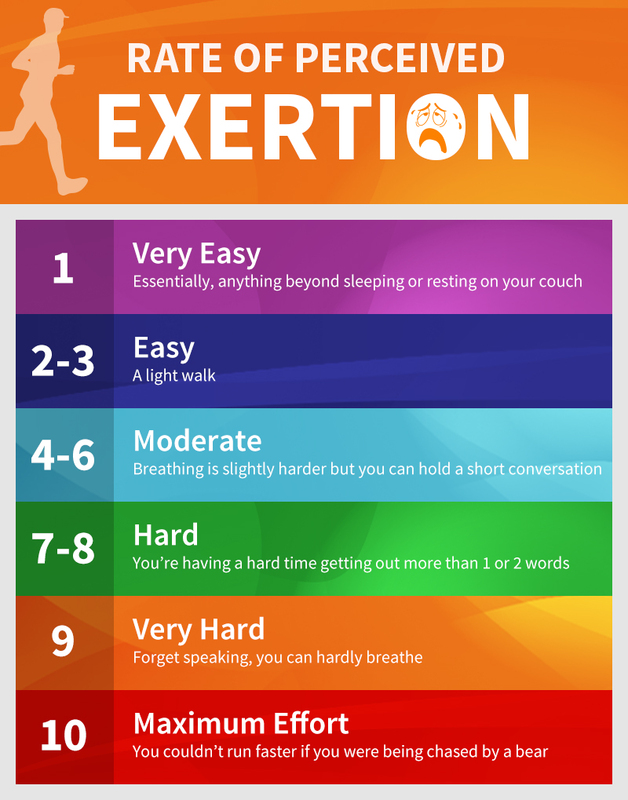 RPE stands for Rate of Perceived Exertion and runs on a scale from 0-10. An RPE of 0 is how you feel at rest. An RPE of 10 is how you feel at your absolute maximum level of effort. This is a fleeing-rabid-animal level of exertion. Ready to hit the pavement? Take a look at the table below for a more detailed scale. Get ready to pump it up 3 minutes into this interval workout. You’ve been warned. This run is meant to leave you with a feeling of sweaty accomplishment. Good news: You’ll be done before you you know it! H.I.I.T It – Find your inner beastmode with a little Jay-Z, Eminem, and Drake in your ear. Rock It Science – Artists like Imagine Dragons, Linkin Park, and Kanye West seamlessly transition from one to the next so you never get bored. H.I.I.T. Your Limit – Kick off your run with non-stop energy from Justin Timberlake, Fall Out Boy, and more! If these don’t suit your tastes, not to worry. RockMyRun’s “Discover Music” feature gives you the option to explore 1000’s of stations in every genre, tempo, and mood. Download the app for free on iPhone or Android to find your perfect beat. Note: This run is not meant for first-time runners or people with injuries. Listen to your body. If you feel light-headed or experience pain, stop. A simple walk around the block is a healthy alternative and will ALWAYS be better than 10 minutes on the couch.